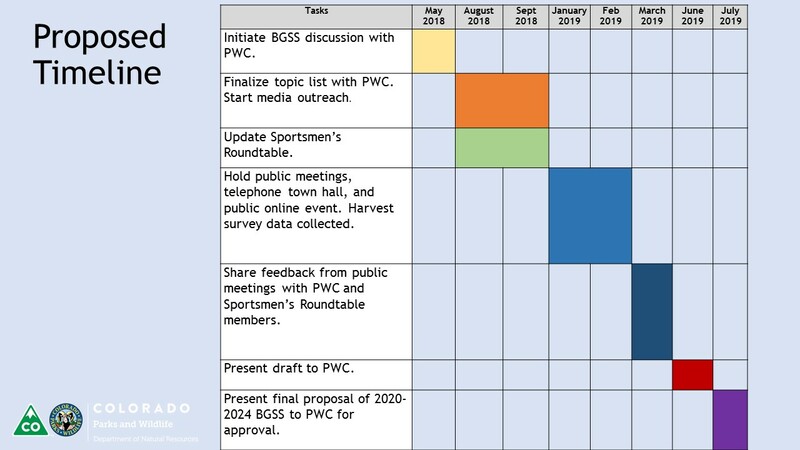 The public comment form is now closed for the 2020-2024 Big Game Season Structure (BGSS). Thank you to everyone who submitted comments. CPW is carefully considering all the input we received from pubic meetings, telephone town halls, and the public comment form. Through this process we have heard from several thousand hunters, both resident and non residents. We greatly appreciate your time and engagement in helping to inform the next Big Game Season Structure. What's the purpose of the Big Game Season Structure Process? Colorado Parks and Wildlife uses a five-year BGSS as a framework for annual big game hunting regulations. What types of hunting opportunities will be available. When opportunities will be available. Where opportunities will be available. How the opportunities will be divided amongst methods of take. What's the process look like for 2020-2024? To provide consistency and predictability. Herd Management Plans (HMPs) establish long-term objectives for big game species in specific geographic areas (Data Analysis Units) through a public process, using the best scientific information on populations and habitat conditions. Annual license recommendations are set annually via regulation and are based on HMP objectives. Big Game Season Structure (BGSS) policies define a framework for achieving HMP objectives through a variety of hunting opportunities and seasons. During this process the public will have a lot of opportunities to share their ideas and input on how we can improve our season structure. This critical feedback helps shape how Colorado Parks and Wildlife staff conserve and manage our herds into the future. Colorado Parks and Wildlife considers the public's comments with great care and looks at numerous options for making changes to the system. A summary of the public's input is presented to the Commission for final recommendations and adoption. View the 2015-2019 Big Game Season Structure, including season dates. Summary Report of Public Involvement. View the 2010-2014 Season Structure General Dates. Thank you to everyone who provided input. The public comment form​ is now closed. View the 2015-2019 Big Game Season Struc​​ture​​, including season dates.